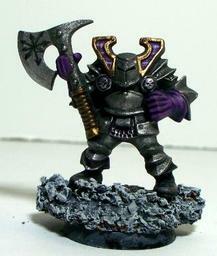 A new champion of Slaanesh becomes more self assured and determined. His willpower is increased by +1 to show this. The caster reaches out and touches the victim’s forehead. The victim immediately enters a blissful, euphoric state for the remainder of the battle. All characteristics are halved. On each turn roll a D6, 1-3 the target is unable to do anything but stand and smile mindlessly, 4-6 the target can act but is subject to stupidity. Special effect on servants of Slaanesh. Target is filled with a sense of well-being and a reassuring air of unreality. It becomes immune to psychology but Initiative is reduced by 2. Special effect on servants of Khorne. Victim’s personality is subjected to an unwelcome but ecstatic pitch of voluptuous enjoyment, His nervous system cracks under the strain and his mind boils. Staggers in a random direction and collapses and dies of uncontrollable delight. Cast at a group of four or more creatures not involved in hand to hand. The victims can do nothing but dance lewdly to the sound of unearthly music that only they can hear. Any attack on the unit will break the spell. Brigands are bandits or rebels who form robber bands to attack travellers, small homesteads and each other. Where these bands split up following the death or capture of their leader, they often join a Chaos Warrior’s warband. Brigands are equipped with a sword or other hand weapon plus light armour and shields. The Goldtongues were among the more hedonistic of the Dwarves in their towering undercity, but Nephem took excess beyond the realm of art into profession. Many were his days spent with slaves and variety of instruments to entertainment, with breaks only for contemplation of perfectly cut gems and feasts that would put high lords to shame. Eventually, when given the choice of having to make something of himself or being cast out, Nephem chose to leave, but only he’d left his former companions and family cavorting until they died from exhaustion or bliss. He traveled the highways and biways, using his skill with instruments to make sure he always had food in his belly, and someone begging him to stay one more night. He left strings of escalating parties in his wake, gathering to him a small group of loyal followers. He trudged towards the Chaos Wastes. There, he heard, he would find everything he wanted out life and more…..